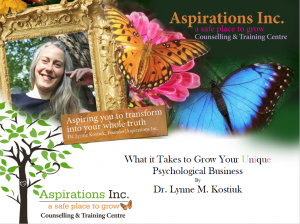 Dr. Lynne Kostiuk has dedicated herself to the growth and development of psychology students, provisional psychologists, and registered psychologists towards building a successful business. She has been nominated by her peers to share her passion and experiences as a speaker at the 2017 PAA Connect Forum. Her ted-talk formatted speech is titled, “What it Takes to Grow Your Unique Psychological Business.” Dr. Kostiuk intends to weave her own business building experiences and highlight the main aspects she believes contributes to building a successful business. She will describe how to grow your success through her exclusive Psychologist in Business Training Program. Whether you are considering a business path or already in private practice, the PiB program may launch your business to the heights you have always imagined. Through this talk, you will gain insight you will need to take on the wonderful challenge of starting your own Psychological Business. If you are currently working or pursuing your education in the field of Psychology come to the “PAA Connect 2017: Our Forum for Learning, Connection & Renewal Past, Present and Future–A Profession of Change” to learn about important topics related to the discipline. Learn about the ways to make your impact in the field of Psychology and what other members of the Psychology Association have learned through the many enlightened speakers at the PAA Connect. Some of the enlightened talks include: keynote speaker Dr. Scott Miller’s “The Future of the Fields: Surviving and Thriving in the Era of Accountability,” and Dr. Sophie Yohani’s talk on “Where “Ubuntu” Meets Psychology: Reflections on Social Justice and Psychology,” and many more. Invest your time in learning about new innovative thought in the world of Psychology. We hope to see you there to share in this opportunity for collective growth!